In the Spring of 2000 I decided to treat myself to a "real" vacation and go to some interesting location without resorting to hopping freights to get there — in other words, I would fly somewhere and rent a car for a week. I'd never been to the National Parks in Utah, and from what I saw on the train going across from Salt Lake to Denver the country certainly qualified as "interesting", so plans were made to fly from Redding to San Francisco, then to Las Vegas, where I would rent a car and drive around aimlessly for several days, drinking in not only the scenery but offerings from Ernest & Julio Gallo. The shuttle flight out of Redding, which left before sunrise, was in a plane that gave me the impression that any crash above a taxiing speed would result in my death and subsequent dismemberment, so I attempted to act casual and doze off on the way to San Francisco, hopefully belying my fears while giving the impression of nonchalance exhibited by a seasoned flyer, which I wasn't. My descent, literatively and figuratively, into the bowels of the San Francisco International Airport awakened me immediately both mentally and physically — everyone was moving twice as fast as would appear to be normal and they were everywhere! My God, I saw more people in 5 minutes than I do at home in a week. And if they couldn't walk fast enough there was always the "people mover" to wring out an extra few miles per hour. The flight to Vegas gave me a brief respite from humanity, but soon I had to deal with another new-to-me airport and an even faster pace into and out of the rental car kiosk, where I settled on a white Dodge Stratus, figuring that it would remain relatively cool in hot weather, and headed north to begin the "fun" part of the trip. It didn't take long to get into the desert and I reminded myself that I should really stock up on alcoholic beverages while I was still in Nevada, as the Mormons weren't known to offer beer and wine on every corner, and I was headed for places with very few corners. Flying along at warp speed on the Interstate, I had barely had enough time to figure out all of the strange dials and knobs the car had in order to settle on a decent radio station and get the air conditioning adjusted the way I wanted it before I pulled off the road and stopped at a large shopping center with a liquor store prominently situated out front. Stowing my pack in the trunk, I entered the store and tried to estimate a week's worth of libations. It was a delicate balancing act between the sheer volume of bottles and cans I thought were necessary, versus the amount (and availability) of ice it would take to keep everything cool. Staggering out of the store with my supplies, as I turned to walk out into the parking lot a terrifying sight was before me — everywhere I looked were white Dodge Stratuses [Strati?]! And they all had Nevada plates! Apparently I wasn't the only tourist to rent a car in Vegas to check out the Parks, select a light-colored one at that, and stop at this last outpost for supplies. Rats! Since I put my pack in the trunk, there wasn't really anything in the car to identify it as "mine", and I didn't use the fancy locking thingie on the keychain to lock it because I was terrified of being unable to unlock it later, since I never drove a vehicle that "modern" before — I couldn't just click "something" and listen for the responding honk or whatever to lead me to my car. But after gingerly trying the door handle on several promising-looking white Dodges I found one unlocked, put the key in the ignition, and it started up — erasing thoughts of setting off countless alarms in my quest to get out of the parking lot before all of my ice melted. The first Park I would visit was Zion, where, because the highway went through it on the way to points east, I would have to pay the $20 entrance fee whether I was "visiting" the Park or just driving through. As it was, just "driving through" was incredibly scenic, but I didn't take the grand tour because I wanted to continue on my way, and it seemed really crowded. 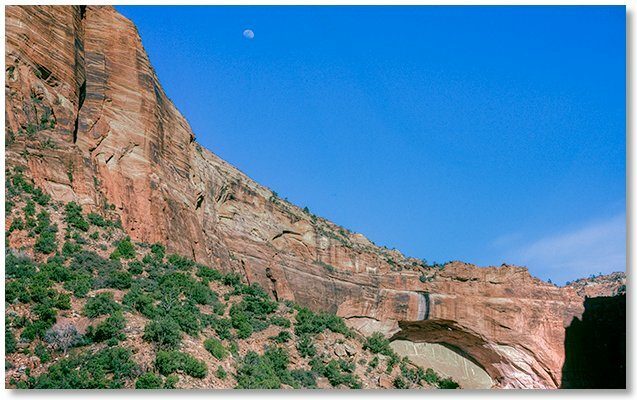 I noticed an almost-full moon and the Great Arch [photo above] from a series of switchbacks before ducking into a long tunnel that led to the east end of the Park. Though still in "the Park", the crowds of tourists were now gone, and I almost hated to continue driving without spending more time looking around, but this was my first visit to this area and I wanted to see a little bit of everything. There was certainly a lot of "everything" to be seen, and I had a very pleasant time just driving around and making mental notes of spots I wanted to spend more time exploring the next time I visited the "Beehive State", even though after a week of driving all over the place, I didn't see a single beehive. The next actual "town" I came to was Escalante, where I got some maps from the BLM office, some much-needed coffee, and various liquid "supplies". Continuing east from Escalante, things were now getting even more "scenic", if that was possible. 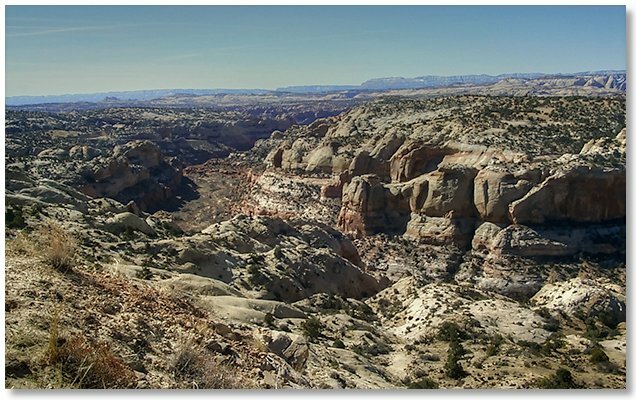 I stopped to get a look at the gorge in the Calf Creek Recreation Area [photo above] with my trusty binoculars, and added this to my "must see sometime" list. I was torn between having the economical rental car, with its great gas mileage and extremely efficient air conditioner, or instead having a jeep, with fewer creature comforts but the ability to cruise around just about everywhere I wanted. Alas, the rental car seemed like the right choice this time, as it gave me a greater range — I'd never have made it farther east than Zion if I had the ability to go exploring along every dirt road I came across. East of Torrey [photo above] things really started to look like... well, Utah. 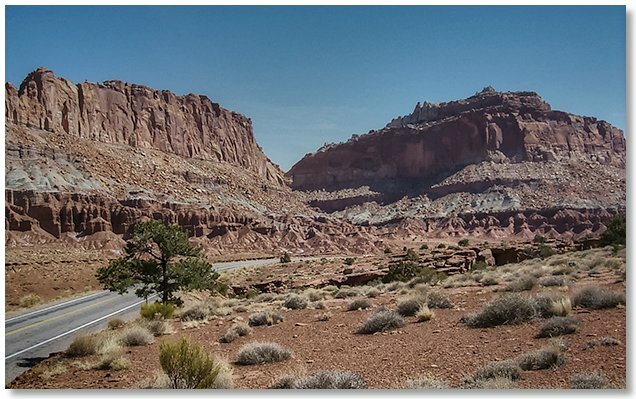 After going through Zion and Bryce Canyon, I was now approaching Capitol Reef, and it was time to get out of the car and actually walk around, even though it was only to the Visitor Center to get rid of the morning's coffee and grab some maps and brochures. By this time I was well on my way to assembling an impressive collection of literature pertaining to the Parks and Utah in general, which would make for great winter time reading. With the simple addition of a liquor store every 50 miles or so, this state could really make a name for itself. 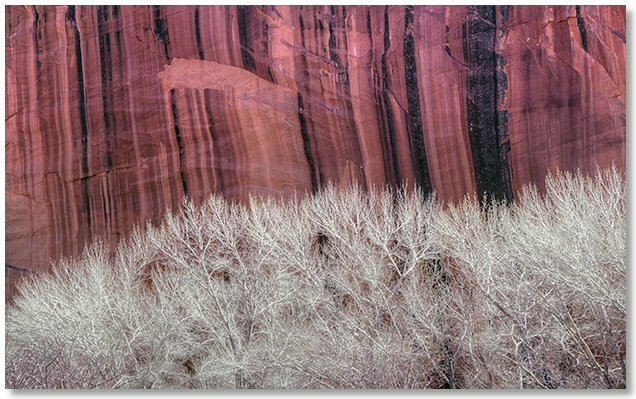 Shortly after reluctantly leaving Capitol Reef I passed this old orchard and cliff near Fruita [photo above], and had to get out again and check it out. At this pace I realized that one week was not enough to even quickly see all the "sights" around here, and at the very least I stood a good chance of wearing out the seatbelt before I made it back to the rental place in Vegas. The stops were a positive step, however, in the process of amassing a sort of geological journal of my travels, as the trunk of the car now contained a collection of rocks that were nothing at all like the rocks I usually come across during my travels back in California. 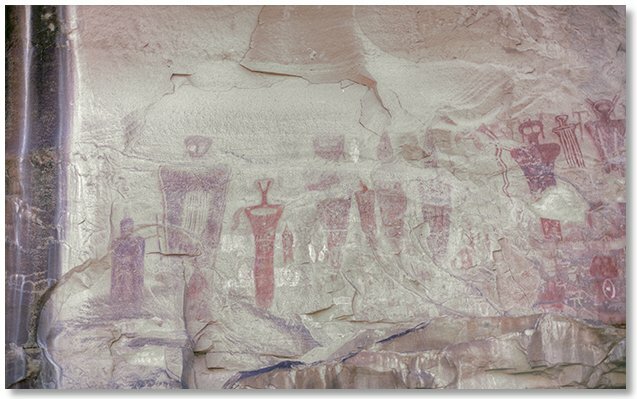 Now veering off on a geological tangent, I had to see the petroglyphs north of Thompson in Sego Canyon [photo above]. Although just a mile or two off of the interstate, there was absolutely no sign of grafitti or vandalism that would occur in 30 seconds if they were in Southern California, or some place like that. I had a difficult time trying to determine if they were actually "real", or just some tourist destination that had been created to inform the public about how things "used to look" in "these parts". The deserted canyon was again almost uncomfortably quiet so I decided to stop and make camp for the night. The steep walls keep away the almost non-existant sound of the highway, and a group of coyotes serenaded me to a long sleep under a star-filled sky. 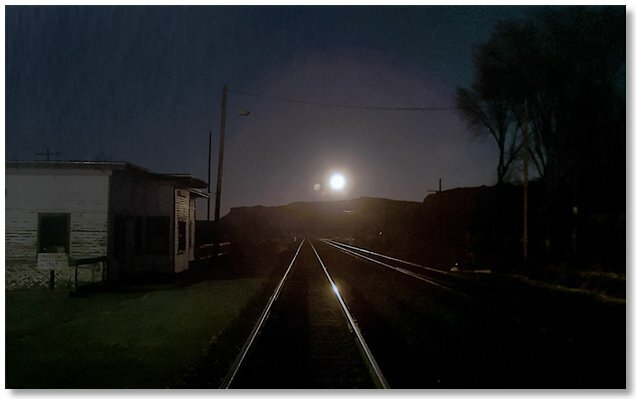 Waking early due to the fact that my week was almost over and I still hadn't seen Arches, I was treated to a moonset at 5:00 am as I crossed the railroad tracks in Thompson [photo above] and headed over to Moab. 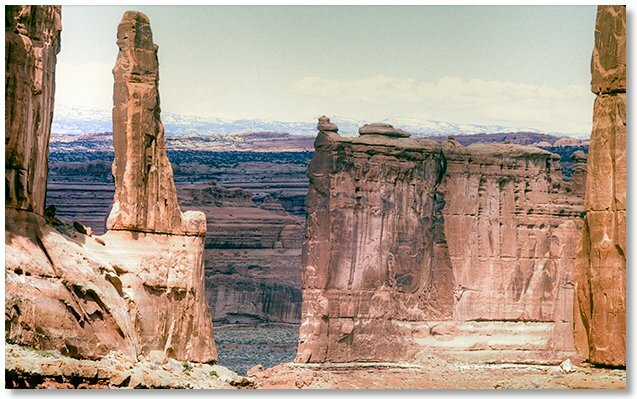 Being perhaps a bit too zealous in my "hit-the-road-early" blitz, I feared that when I got to Moab there would be nothing open at that early hour, but I was mistaken, to say the least. Never having been here before, I was expecting some sleepy hamlet in the middle of nowhere, but such was not the case. Moab was a real "town" all right, and whatever tourists I may have missed in the last few days of driving around seemed to have all materialized here. As this was the gateway, so to speak, to Arches National Park, I was sure that once I left town I would have little desire to return, so I augmented my map/brochure collection, stocked up on groceries and "supplies", bid farewell to a growing mound of trash in the back seat, and headed over to the Park. Even with the half hour wait at the Entrance Station, this was indeed a very cool spot. Passing by Courthouse Towers [photo above] I developed an overwhelming urge to pee after some killer coffee in Moab, but there really wasn't anywhere to hide from the constant parade of vehicles driving by, and since the ground everywhere was covered with the precious "macrobiotic soil", or whatever it was called, that could get you jailed for life if you stepped on it, I resorted to creating a sort of portable "urinal" by draping my sleeping bag over the opened back door on the passenger side of the car, and hanging my tent out over the opened front door, giving passing motorists the impression that I was simply drying out my camping gear, I hoped, while I peed and smiled and nobody was the wiser.